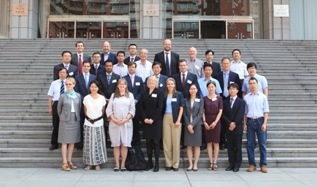 On 2-6 September 2013 Renmin University Law School in Beijing, China hosted the first conference of its kind uniting public law scholars from British and Chinese Universities. Over the course of five days scholars discussed a variety of topics relating to the conference theme: The Rule of Law in Modern Constitutionalism. The conference was organised by Nick Barber (Oxford) and Jeff King (UCL) and Ruiyi Li (Nankai University) in conjunction with the UK Constitutional Law Group, Renmin University, and the British Foreign and Commonwealth Office. The other scholars in the British delegation were Tarunabh Khaitan (Oxford), Dawn Oliver (UCL), Andrew Le Sueur (Essex), Hayley Hooper (Oxford), Paul Yowell (Oxford), Aileen McHarg (Strathclyde), and Martin Loughlin (LSE), and Ewan Smith (FCO). The conference took place over four days, with Wednesday involving specially organised visits to the Supreme People’s Court (SPC) and the Administrative Division of the National People’s Congress of the People’s Republic of China (NPCPRC) for the British delegation. The sessions in the conference included Constitutional Structures (including soft law and conventions, and a comparison between structures in Britain, Europe, and Hong Kong), the Rule of Law and the Judiciary, Human Rights (including political and legal protection mechanisms, and the rule of law in the welfare state), and Administrative Law. The conference was attended by both faculty members and graduate students, and was enhanced by robust open discussion from all participants. Particular highlights of the conference included Ruiyi Li’s paper on the Qi Yuling case from 2001; which was the first case in which the Supreme People’s Court gave direct effect to the constitution in the context of the right to receive education. The decision was, however, subsequently rescinded. Paul Yowell also delivered an engaging paper on the history of the drafting of the Universal Declaration of Human Rights and the shared cultural values between east and west which underpinned it; thus challenging the oft-held perception that the UDHR is a ‘Western’ document. Cora Chan also provided insight into China’s management of its Special Administrative Regions under the policy of ‘one country, two systems’. Hong Kong is a region which retains much of the British common law system. Although the region retains a significant degree of autonomy in many spheres of life the final court of appeal must refer any questions of constitutional interpretation not to the Supreme People’s Court, but to the Standing Committee of the National People’s Congress, which is a political body controlled almost exclusively by Communist Party members. The specially organised visits to the SPC and NPCPRC afforded a truly unique insight into China’s constitutional mechanisms. 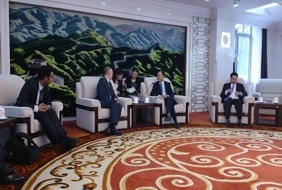 In the Supreme People’s court the British Delegation had an audience with the Court’s President Wang Shenjun and President of the Administrative Division Zhao Danguang. 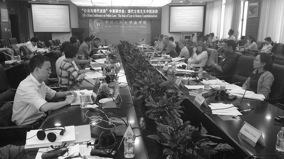 China is presently considering the possibility of establishing a separate system of administrative courts (having released a white paper on judicial reform in 2012) due to criticisms of bias and Communist Party interference in ordinary local courts in relation to disputes between citizens and government agencies. Despite progress in the realm of open justice, access to court hearings remains difficult (prior application and a background check for members of the public is required before attendance), and Communist Party interference in cases remains a problem. President Wang Shenjun recounted his own visit to the United Kingdom in 2002 where he met with former House of Lords and Supreme Court Justice Lord Phillips of Worth Matravers in London. The President also sought the opinion of the British delegation upon possible directions that the establishment of a system of Chinese Administrative Courts might take, in particular Wang Shenjun was curious about the differences between the English common law system and the civil law system of public law courts present in France and Germany. Several lasting impressions from the experience are of general value to scholarship in constitutional law and theory. The first is perhaps will be trite to comparative constitutional scholars but nonetheless it seems to be a truism. That is: one cannot accurately or fully reflect on the merits and pitfalls of one’s own system of constitutional organisation without seeing it through another’s eyes. To this end, the contributions of the Chinese scholars and graduate students were of enormous value in providing opportunity for critical reflection on the British constitution. The less obvious and perhaps more valuable intellectual insight to be drawn from the experience is the frank illustration the experience provided of the inherent (and fluctuating) link between constitutionalism and cultural values. China is experiencing an almost indescribable and unprecedented rate of economic and cultural transition. Prior to the trip this author found it all too easy to take the merits of particular ideas or modes of constitutional organisation for granted. In this respect contributions from Chinese scholars explaining the legacy and relevance of Confucian values and the Cultural Revolution to China’s constitutional development helped to emphasise the contextual nature of both the development of constitutional law and practice, and more importantly the highly contextual nature of the appropriateness of approaches to constitutional law scholarship; in particular attaching value to certain normative perspectives on constitutionalism. This was nowhere more aptly illustrated than during the robust debate about the value and meaning of the Rule of Law between Nick Barber, Martin Loughlin, Lin Laifan, and Zhu Jingwen. On a more personal note, I’d like to extend my sincerest thanks on behalf of the whole British delegation to Dean Han of Remnin University, Ruiyi Li, and Ewan Smith at the Foreign and Commonwealth Office. Dean Han, Ruiyi Li, and a wide circle of academic colleagues and graduate students showed extraordinary hospitality and friendship in welcoming us to both the Law School and China and ensuring that we had both a rich and memorable cultural experience over and above an invaluable academic experience. 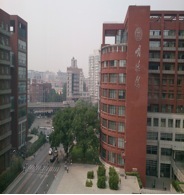 This entry was posted on September 13, 2013 by Constitutional Law Group in China, Comparative law and tagged China, Conference Report.